Use Total Show Technology's beMatrix LEDskin at Your Next Meeting, Event, or Trade Show! Attract Attention with Breakthrough beMatrix LEDskin Technology at Your Events! LAS VEGAS, NEVADA, UNITED STATES, April 4, 2019 /EINPresswire.com/ -- beMatrix LEDskin® next-generation technology enables quick combination of LED cabinets and frames to create the high-definition video wall of the future. Components can be integrated easily into a beMatrix stand to avoid separate display screens, which often disrupt sleek stand designs. Total Show Technology (TST) has invested in beMatrix LEDskin to provide cutting-edge, high-impact LED technology for clients who host, plan, or manage conventions and conferences and participate in trade shows and exhibits. beMatrix LED tiles offer a more elegant solution than other LED and modular system technologies. With LEDskin, LED tiles automatically align with each other and with the frame system, so you’re not limited to the standard dimensions of individual display screens. LED cabinets and frames fit perfectly together, resulting in a slim building solution that needs no massive construction behind it. Both the frame and the LEDskin are 62 mm thick, allowing easy assembly and finish. In fact, the LED wall is plug and play: just build in the cabinets, plug in the sockets, and connect the video device or computer. Then start the video or application, and the beMatrix walls instantly come to life. The beMatrix frame system offers the best of two worlds: a made-to-measure product and a modular, reusable system. The same product can be used in unlimited designs, making beMatrix the only system to build not only walls but also corners, curves, ceilings, and floors. 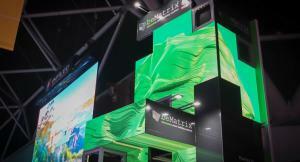 LEDskin transforms a beMatrix stand into a real hotspot, full of animation, video images, and moving graphic elements. It’s a 360° solution. LEDskin is powered by Novastar, the global leading LED display control solution. LEDskin modules are available in three pixel pitches – 2.5, 3.1, and 3.8 – offering optimum resolution and clarity. The holes in the beMatrix frames act as cable conduits, eliminating cable spaghetti at the rear of the stand. beMatrix LEDskin offers a clean, custom-build, custom-branded look, and it’s a real breakthrough for video walls in modular structures. By combining sturdy aluminum frames with panels or textiles, beMatrix bridges the gap between traditional wood construction and prefabrication. The beMatrix system offers rapid build and assembly, which saves time and labor. It’s the strongest, fastest-building, most ergonomic, most lightweight, and only tool-less system in the market. LEDskin’s revolutionary design creates new opportunities and extra value for both modular systems and the LED market. Best of all: TST has LEDskin available for use at corporate and association events, nightclub live events, and trade shows. If you need big video walls, exceptional visual impact, and endless possibilities, LEDskin is your solution. Just supply your video, and TST will take care of the rest. Together, let’s make your next event a showstopper! About beMatrix® USA: beMatrix, headquartered in Roeselare, Belgium, with production facilities in Roeselare, Norcross, GA (USA) and Hangzhou, China, and sales and distribution offices in 61 countries, manufactures a Tooless™, reusable frame system for the exhibit builder, general contractor and event producer industries. The same aluminium frame accepts both hard panel and fabric infills. Combining its new 360° Design initiative and Tooless™ approach, The System is recognized for its quick and easy construction of walls, ceilings and doors. Used worldwide for exhibits, events, pop-up venues and displays, The System is complete with straight and curved frames, doors, counters, lighting and wall mounting accessories. The System is considered environmentally sustainable, providing endless reusability as the same aluminum frames are continuously reconfigured and redesigned into new structures. The beMatrix® factories support complete sustainability by recycling 100% of all waste created during the fabrication process. To learn more about beMatrix, visit www.beMatrix.us. About Total Show Technology (TST): TST is the total show production solution for anyone who hosts, plans, manages, or produces events, meetings, and trade shows. Based in Las Vegas, TST owns the Pacific Southwest market and travels with clients nationwide. TST provides audio, video, lighting, AV rental, AV staffing, LED/pixel repair, and event production for corporate and association events, nightclub live events, and trade shows. Whether you’re looking for audio visual support or advanced event technologies that enable you to deliver your message effectively, TST helps your shows go off without a hitch and always makes you look good. In an industry where almost anything can go wrong, TST makes sure everything goes right. For more information, visit www.totalshowtech.com.